Today there were 12 players returning to take their shot at the bracelet and the $326,440 first prize. 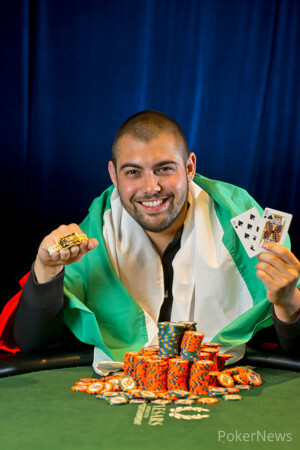 At the end of it all, it was Simeon Naydenov with his head held high and his country's flag draped around his shoulders as he held the World Series of Poker Bracelet for his winner's photo. Naydenov was making his second appearance at a shootout final table this year and while he finished tenth in that event, he was able to do today what he couldn't then. It only took about seven hours to reach a winner here in Event #36, but play today began with 12 men all trying to reach the final table. With the 12 players beginning at two six handed tables, two had to fall for the players to reach the official final table. It looked as if Nacho Barbero would be one of the first to fall as he found himself on a short stack, but he was able to double up to save is tournament life. The first to fall today was Vladimir Kochelaevskiy, who showed up late and left first. Kochelaevskiy was crippled after his couldn't catch up to Salman Bebehani's and he was eliminated on the next hand. Next to fall was Kevin Vandersmissen who was eliminated when his ran into Mike Watson's . It was 28 hands into the final table when Sumanth Reddy was eliminated. He got his money in good, but Andrew Kloc ran better and eliminated Reddy from the tournament. The next three to fall were Noah Bronstein, Salman Behbehani, and Jan Kropacek. Kropacek got off to an early chip lead at the final table, but ended up doubling up Naydenov with a combo draw against Naydenov's aces. It was Mike Watson who fell next. He moved all in with an overpair of s against Naydenov's s, but a nine on the turn ended Watson's tournament and he left in sixth place. Falling after Watson was Nacho Barbero, who moved all in with and was instantly called by Tobias Wenker's . Barbero couldn't catch up and he was sent to the rail in fifth place. Coming in fourth was Wenker himself. He moved all in from the small blind with and was snap called by Jake Schwartz's aces. The board didn't improve Wenker at all and he was sent home with fourth place prize money. The third to last man to drop was Andrew Kloc. Kloc four bet shoved all in with and was snap called by Naydenov who was holding . The board brought both players a full house, but Naydenov held a better one and he scored the knock out. Heads up play only lasted 10 hands. Just before the last hand of the match, both Naydenov and Schwartz took a shot of tequila. That shot may have proved to be Schwartz's downfall because on the next hand he ran his top two pair into Naydenov's nut flush. Naydenov faded Schwartz's outs and that was it, the match was over. 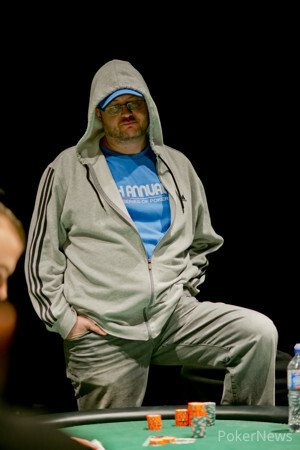 Schwartz walked away with second place prize money for his efforts while Naydenov took down $326,440 and a World Series of Poker bracelet for his accomplishments. That's it for us at PokerNews.com here in Event #36: $1,500 No-Limit Hold'em Shootout. Be sure to stay tuned to all our coverage of the 2013 World Series of Poker. 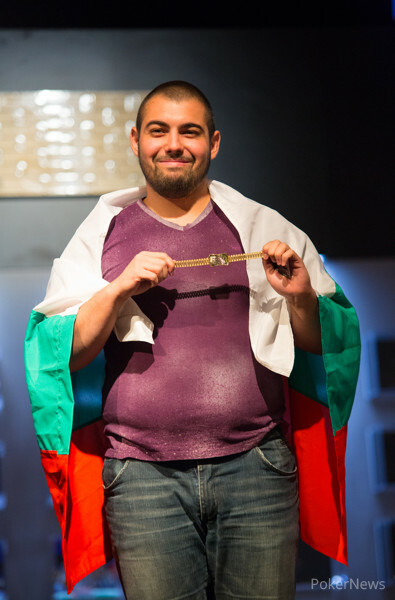 Simeon Naydenov wins the gold bracelet in event 36 at the 2013 World Series of Poker to make his home country of Bulgaria proud. Hand 157: Naydenov raised to 60,000 and Schwartz called. The two took to a flop of , Schwartz checked as did Naydenov. On the turn Schwartz checked to Naydenov who bet 65,000. Schwartz reraised to 160,000. Naydenov folded. Hand #158: The players each took a shot of tequila before the hand. Jake Schwartz raised to 60,000 before the flop on the button. He was called by Naydenov from the big blind. The two men took to a flop of . On that flop Naydenov checked to Schwartz who made a bet of 55,000. Naydenov reraised to 150,000. With action back on Schwartz he reraised to 455,000. Naydenov moved all in and Schwartz called. Naydenov had flopped the nuts but he needed to avoid Schwartz pairing up on the last two cards to lock up the bracelet. The turn was the , keeping Naydenov in the lead. The river was a blank , securing the elimination and removing Jake Schwartz from the tournament in second place. 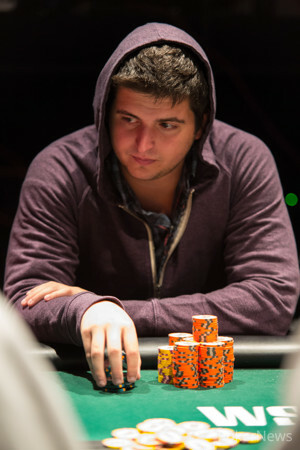 Hand #149: Jake Schwartz receives a walk in the big blind. Hand #150: Jake Schwartz opens to 60,000 from the button and wins the big blind and antes. Hand #151: Simeon Naydenov opened with a raise and won the big blind and antes. Hand #152: Jake Schwartz opened to 60,000 and Simeon Naydenov made the call before check-folding to 55,000 on the flop. Hand #153: Jake Schwartz receives a walk in the big blind. Hand #154: Jake Schwartz opened to 60,000 and Simeon Naydenov made the call to see a flop. Naydenov check-folded to Schwartz's 55,000-chip bet. Hand #155: Simeon Naydenov raised the button and Jake Schwartz made the call. The board was checked down until Schwartz bet out 130,000 and Naydenov folded. Hand #156: Jake Schwartz opened the button to 60,000 and Simeon Naydenov three-bet to 175,000 to force a fold from Schwartz. The two remaining players aren't taking a break and are just getting straight into heads-up play. Hand #146: Jake Schawartz received a walk in the big blind. Hand #147: Schwartz raised to 60,000 from the small blind and won the pot. Hand #148: Schwartz raised to 60,000 from the button. From the small blind Simeon Naydenov reraised to 165,000. From the big blind, Andrew Kloc moved all in. Action folded back to Naydenov who snap called. The flop came down and that gave Kloc a little hop as he saw the nine fist, but the jack kept Naydenov in the lead. The turn was the giving both players two pair. The river was another giving both players a full house, but Naydenov the better full house. Just like that Kloc was eliminated from the tournament in third place. Hand #143: Andrew Kloc limped in only to have Jake Schwartz make it an additional 55,000. Kloc made the call before checking the flop before Schwartz bet out 65,000. Kloc check-raised to 160,000 and Schwartz folded. Hand #144: Jake Schwartz limped in and Simeon Naydenov checked before calling a 35,000-chip Schwartz bet on the flop. Schwartz continued for 60,000 when the turn landed the and Naydenov called again as the completed the board on the river. Schwartz tossed in 140,000 and Naydenov instantly called tabling his for trips to win the pot. Hand #145: Jake Schwartz opened the button to 60,000 and both Simeon Naydenov and Andrew Kloc made the call. The board was checked down before Kloc bet out 90,000. Schwartz and Naydenov both made the call before mucking at the sight of Kloc's . Hand #139: Schwartz raised from the button and both players called from the blinds. On the flop both players checked back to Schwartz who bet 80,000. Both blinds folded and Schwartz won the pot. Hand #140: From the small blind Andrew Kloc raised to 65,000. Schwartz called from the big blind and the flop came down . Kloc checked to Schwartz who bet 80,000 and Kloc folded. Hand #141: Andrew Kloc raised to 65,000 on the button. From the big blind Simeon Naydenov called. Both players checked to the river where the board read . Naydenov bet 100,000. Kloc called, but mucked when Naydenov showed for trip fives. Hand #142: Schwartz raised to 60,000 from the button but folded when Kloc moved all in over the top from the big blind. Hand #136: Jake Schwartz opened to 60,000 from the button only to have Andrew Kloc move all in. Schwartz folded and Kloc collected the pot. Hand #137: Simeon Naydenov opened the button to 60,000 only to have Andrew Kloc move all in. Naydenov folded and Kloc won another. Hand #138: From the button Andrew Kloc opened to 70,000 only to have Jake Schwartz three-bet to 155,000. Kloc pushed all in for a third consecutive time and Schwartz mucked.